Chair Rachel Maisler testified at the BAC’s annual performance oversight hearing on Feb. 25. The Facilities Committee met to plan spring and summer rolling meetings, a.k.a. field rides. Joined by two DDOT planners, the Facilities Committee discussed areas for upcoming rides. The Legislative Committee also met and identified a timely measure to raise for a BAC vote in March. Ward 1 member Emily Oaksford was reappointed. As the calendar turned, a new BAC member took office. Anders Pedersen has joined as Councilmember Mendelson’s representative. The BAC meets on March 6 at 6 p.m. at 441 4th St NW, 11th floor. View the agenda here. The BAC meets on March 6 at 6 p.m. at 441 4th St NW, 11th floor. BAC committees held their bimonthly meetings in December. MPD Assistant Chief Jeffery Carroll attended the Safety, Education and Enforcement Committee meeting to discuss law enforcement matters with committee members. The following news stories and press releases appeared in December. DDOT Launches New Safety Measures in Support of Mayor Bowser’s Vision Zero Initiative – left turns are being reconfigured to slow drivers and increase pedestrian safety; right turns on red will be prohibited at 100 intersections. For more information, see this news story and this map of the intersections. A bus driver struck and killed two pedestrians in late December at 7th Street and Pennsylvania Avenue NW. The driver was arrested and reportedly distracted by his phone. The Washington Post editorial board had this to say: Too many people died in D.C. traffic crashes in 2018. We can do better in 2019. Dockless vehicles: looking back and forward – DDOT released a report on the dockless vehicle pilot program. Media coverage included D.C. Just Released the First Evaluation of Its Dockless Bike and Scooter Experiment and Six things D.C. says it’s learned about scooters and dockless bikes since they arrived. At present, DDOT Announces Operators for 2019 Dockless Vehicle Sharing Program. The press release links to the pilot program report and the regulations (rulemaking) now governing dockless vehicles. Media coverage included D.C. Could Have As Many As 16,800 Scooters And E-Bikes On The Roads Next Year and DC’s getting 20,000 shared bikes and scooters in 2019! Well, maybe. DDOT is studying the possibility of adding an adaptive bikeshare program. The public is invited to learn more and complete a survey here. Last but not least, Metro to welcome bicycles on trains at rush hour. The BAC meets on Jan. 9 with Chief Carroll as the guest speaker. See the full agenda here. The BAC meets on Jan. 9 at 6 p.m. at 441 4th St NW, 11th floor. The BAC meets on Nov. 7 at 6 p.m. at 441 4th St NW, 11th floor. 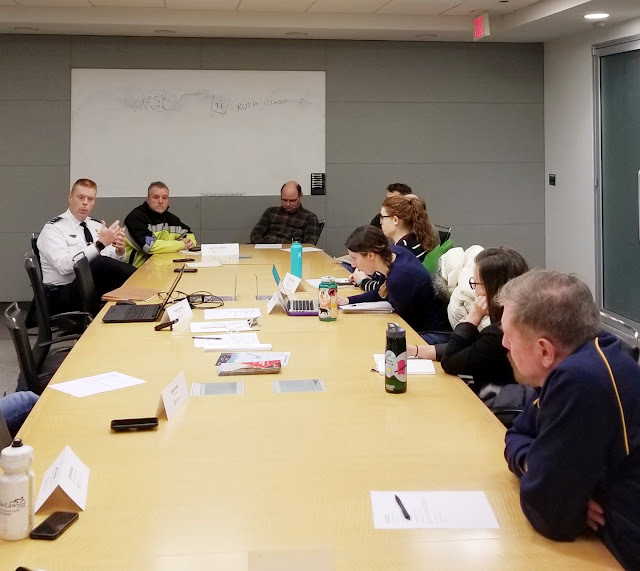 The Safety, Education and Enforcement Committee held an Oct. 4 field meeting in conjunction with a memorial ceremony for cyclist Thomas Hollowell, struck and killed in September at 12th Street and Constitution Avenue NW. The committee recommended a number of safety improvements to lessen the hazards for bicyclists and pedestrians. 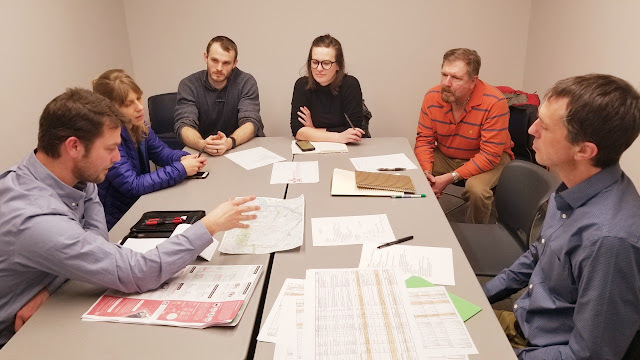 A dozen bicyclists attended the Oct. 18 Facilities Committee rolling meeting in the Brookland/Columbia Heights Crosstown Protected Bike Lanes project area. 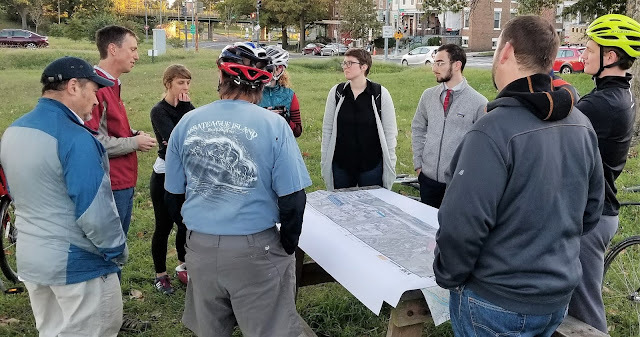 Participants reviewed DDOT design alternatives and rode along designated streets to give feedback about the proposed cycletrack. Facilities Committee participants reviewed the maps at the start of the meeting. The rolling meeting stopped at an intersection to evaluate options. The BAC meets on Nov. 7 at 6 p.m. at 441 4th Street NW, 11th floor. The meeting will focus on law-enforcement issues and discussion with Sgt. Terry Thorne of the police department. Assistant Chief Jeffery Carroll is scheduled to attend the following BAC meeting on Jan. 9, 2019. The November agenda will be posted in the coming days. The BAC is also evaluating dockless bikeshare in response to the DDOT announcement about proposed rulemaking. The agency is accepting public comment through Nov. 26. The Sept. 5 bimonthly meeting featured discussion with DDOT Director Jeff Marootian. A full house of appointees and members of the public questioned Marootian about infrastructure improvements, Vision Zero implementation, and other ways to increase bicyclist safety. BAC chair David Cranor and Ward 4 member Rachel Maisler testified at a Sept. 27 Vision Zero roundtable held by the Council Committee on Transportation and the Environment and the Committee on the Judiciary and Public Safety. Click the links to read the testimony of Cranor, Maisler, and the BAC’s official position. See also the in-depth Pedestrian Advisory Council testimony. Individuals and organizations can submit written comment through Oct. 11. For instructions, see the hearing notice on the Council calendar page. Audio and video recordings of the six-hour hearing are posted here. The committee will assemble at Farragut Square for a public ride to 12th and Constitution, where bicyclist Tom Hollowell was killed on Sept. 24. The committee will study the intersection to recommend safety improvements. Details and RSVP here. The rolling meeting will survey parts of the Brookland/Columbia Heights Crosstown Protected Bike Lanes project. Save the date for the next full BAC meeting on Nov. 7 at 6 p.m. at 441 4th St NW.